INTI International University (INTI IU) recently hosted the Majlis Taklimat JPA Bursary 2016 in collaboration with Jabatan Perkhidmatan Awam (JPA) for the very first time. 714 SPM 2015 students who achieved 9A+ and above were eligible for the JPA scholarship. Professor Dato’ Dr. Rahmah Mohamed, Vice Chancellor of INTI International University together with Key Officials from Jabatan Perkhidmatan Awam during the Majlis Taklimat JPA Bursary 2016. The event was attended by approximately 1,200 guests, including 500 chosen top scoring SPM 2015 students and their proud parents. Following the welcome speech by Professor Dato’ Dr. Rahmah Mohamed, Vice Chancellor of INTI International University, the event was officiated by Yang Berbahagia Datin Dr Rosslina Binti Ahmad Mokhtar, Pengarah Bahagian Modal Insan, (JPA). “We at INTI IU are honored to be chosen as the host of ‘Majlis Taklimat JPA Bursary 2016’. With this partnership, INTI is committed to building strong relationships with JPA to ensure we provide the best higher education options for these top scoring students,” said Professor Dato’ Dr. Rahmah Mohamed, Vice Chancellor of INTI International University. During the event, students were provided with a brief on the KPM Bursary Program. They were also informed of the current changes in regards to the implementation and new requirements imposed upon the program. 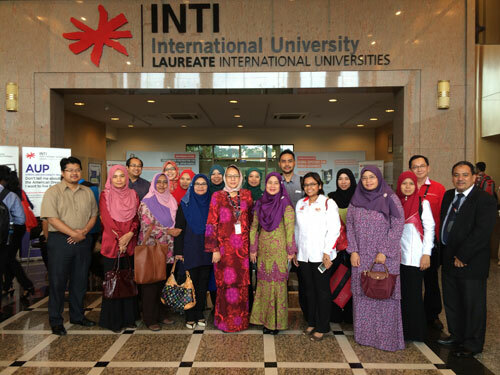 Following which, students and parents were able to receive an extensive tour of INTI IU’s campus and booths from other private higher education institutions. Other key officials from JPA who were also the main speakers during the day were Puan Ruziah Binti Hj Shafei, Timbalan Pengarah, Bahagian Modal Insan, Jabatan Perkhidmatan Awam; Puan Siti Zaharah Binti Omar, Ketua Penolong Pengarah Bahagian Modal Insan, Jabatan Perkhidmatan Awam; and Puan Aifaa Binti Ariff, Ketua Penolong Pengarah Bahagian Modal Insan, Jabatan Perkhidmatan Awam.